Ferodo is one of the world's premium braking brands and one of the global leaders in both original equipment and aftermarket products. The brand has excelled for over 100 years in leading technical innovation. Today, Ferodo is synonymous with excellence and a continued commitment to developing braking solutions for the future. 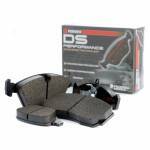 The DS Performance range of brake pads that we offer, transfers Ferodo's racing pedigree to road tuning. For those seeking a replacement road pad which has the feel of a racing compound but the refinement of a premier OE material, DS Performance is the ideal choice. Most Carnoisseur Outlets can offer a fitting service for Ferodo Brake Pads - please contact your local Outlet to find out more.